Moms supporting each other and MCC through business interactions. Where your promotional dollars work double duty: marketing and philanthropy! Place your offerings in front of over 2,700 local moms, and help us keep Mama’s Comfort Camp membership free forever. 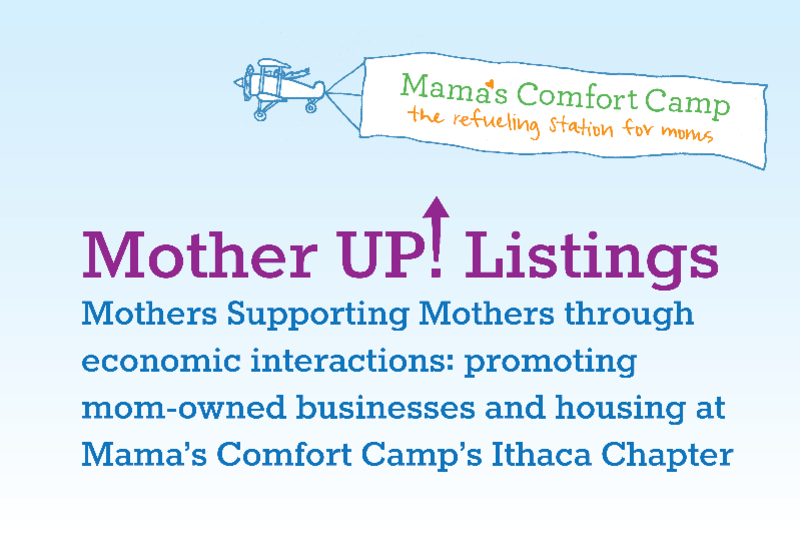 According to Facebook Analytics, an average of 1,200 local moms interact with the Ithaca Chapter of MCC every day. We invite you to advertise, to seek employees and partners, and to conduct research and development conversations with the mama members of our community. Option 1 at $10 a month is especially priced for businesses just starting out, micro-businesses, or for those who are going through a squeeze. 1. A comment listing on the specialty thread of your choice: it can include an image, text, and links to other web pages, including online stores. 2. Conversation posts: are separate from the specialty thread, and can be used for research and development conversations, recruitment, or to highlight specific events or promotions. With Option 1 you get 1 conversation post per three months period. With Option 2 you get them every month. 3. Recruitment Thread listings: searching for employees or partners? List them on our job offers thread. With Option 1 you get 1 recruitment listing every three months. With option 2 you get them every month. Minimum engagement period is 3 months. Choose to engage for a whole year and you’ll get 12 months for the price of 9. That's $90 a year for Option 1, $180 a year for Option 2. Choose Option 2 for a year and be included in the "Mother Upper Circle": a gratitude list we will feature in the group and our public page and website. MamaMade: for products and gifts made or sold by moms. MamaHelper: cleaning services, home-aid, organizers, personal shoppers, gardeners, cab drivers, carpenters, contractors, etc. Housing thread: Rentals and homes for sale, AirBnB / Vacation properties. Mama Professional: designers, architects, writers, editors, photographers, lawyers, insurance providers, financial advisors, accountants, realtors, etc. Recruitment Thread: where our business owning moms can list job openings (included, option 1 gives you one recruitment thread post per three months, option 2 gives you one every month). Mama Wellness: fitness, meditation, massage, life-coaches, therapists, solo medical and mental health providers. Mama Teacher: for those offering classes, lessons, workshops etc. Can't decide which thread is right for you? Message us and we'll help you make this decision. Get a comment listing in the Housing Thread and one independent post each month. Minimum engagement period is 3 months. Sign up for a year and get it for the price of 9 months, and a mention in the “Mother Upper Circle” gratitude list. Realtors who sign up at the "Mother Upper Circle" level get 4 housing listings included with their annual contribution, and can buy additional listings for $50 a month. We want to make this opportunity accessible to as many mothers as possible, so we are very open to trade and barter. Scroll all the way down for more info on that. Great! Choose one of the contribution buttons above and complete the transaction. Then message the MCC Page and let us know which specialty thread you'd like to use (if you happen to make your payment using the anonymous option, or if your transaction name is not the same as your name or your business, please send a screenshot of your payment page as well as your thread choice). We will then guide you through the next steps.